Do not be spooked by today's FOMC announcement selloff. The play has not changed, the right shoulder for the SPX is still being built. These two posts discussed the potential head & shoulder pattern and the forming of the right shoulder: "Fibonacci Magic" and "What Did The Market Do?" Here's the updated intraday chart for the SP500 emini futures and what price actions to watch for the coming days. Last Sunday, I put up a post "What Did The Market Do?" which I presented a possible scenario on what the SP500 index might do in the coming days or weeks. In this video, I will present how the current potential relief rally might lead to the scenario I have presented for the SPX using the SP500 Emini Futures. Last Wednesday, January 20, 2016, many market internals reached extreme on the negative side. The U/DVOL was more than 20 to 1 favoring the downside during the flush, the A/D line was almost completely dominated by the decliners, and the new high-new low fell below August 24,2015 level. It was like a panic flush. Go back and take a look at the 1/20/2015 morning TICK and see for yourself how many of them dipped below -1000. The market gave a valiant effort on trying to recover from its session loss but fell short at the end. The breadth showed improvement as the buying starts to accelerate and squeezing out some of shorts. The rotation from the A/D line once again gave the clue to be on the lookout for a reversal. The NDX was positive for a brief period with a slight positive breadth. But at the end, the momentum just wasn't there to carry it through with a positive close. Remarkably, the RUT closed with a small gain of +4.45 points. During the trading session, extremity in the U/DVOL, A/D and new high-new low occurred. This casts doubt on any sustainable rise for the market. Any rally should be viewed as oversold or dead cat bounce until a confirmed low has been made. Since the end of last July, AAPL has been on a skid. Recently, lots of talk about AAPL could disappoint on the upcoming earnings report due to Iphone sales slowdown. The market continues to hold above the last August low. The SP500 opened strong, then it faded as the A/D line started to reverse and went negative. Downside momentum dominated throughout the session until the last hour of trading, then the A/D started to reverse a bit and the tick started to show some buying coming into the market. The SPX printed an inside bar spinning top candle, showing indecision. For the non-short term traders, one might consider staying on the sideline until the market give more clarify on its near term intention. One of the reasons for watching multiple possible scenarios is to identify potential confluent. As there are more setups projecting a similar price target, a greater chance the price will converge to that target level. The SP500 Emini Futures displayed a confluent at the 1900.75 level in the overnight session. 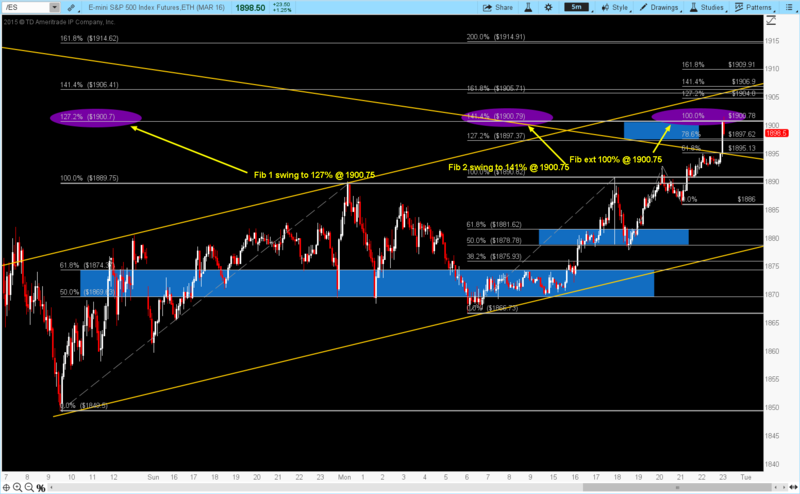 Three different setups were projecting a possible price target near 1900.75. The first setup is from a longer time frame Fibonacci retracement, second setup is a Fibonacce retracement from a shorter time frame, and the third setup is the Fibonacci extension via a possible bull flag measured move. The confluent from these setups does not guarantee the 1900.75 level will be hit, it simply imply a higher probability that the price will reach this level. And this time, the odds played out and the price tagged the 1900.75 before it pulled back. Finally, the long awaited test of the August low has arrived. The SPX went below August 24, 2015 low when it dipped down to 1857.83. The DJI held above the August 24, 2015 low, but it did come down to test the September 29, 2015 low of 15,942.37. The NDX didn’t drop down to test its September 29 low of 4053.12, it didn’t even test that day’s close. The RUT continues its downward trajectory and put in another new low from its high. So far in the new year, the market has not been very kind to the longs. But don't be despaired, a dead cat bounce might be in the offing. Before you dive in on anything that bounce, pay attention to the earnings date as the new earnings season has just begun. In my last post, "Shaky Start", I stated there is a positive breadth divergence and that a rally could soon appear. Although the market continues to drop last Thursday and Friday, the positive divergence still has not dissipated but is getting close to be back in sync. As a good student of the market, I will wait until the divergence has disappeared to give up on the expectation of a dead cat rally. And if we look at the latest price action, things have not broken down as the market lead us to believe, at least not yet! So far, the market started 2016 with a lot of shakings. The SP500, SPX has lost 53.68 points or -2.6% after the first three days of trading. Many are wondering is this the beginning of the long overdue ‘bear’ market. Whether it is or not, let’s take a look at what the market has been telling us. 2016 Came In With A Bang! Happy 2016 everyone. What a start for the new year. Market came down hard, and many blame the China market for the drop. But whatever the reason, this drop seem to be in the work for the last couple weeks. In this video, we will take a look at the indexes and their respective ETF along with these MOMO stocks: AAPL, FB, BABA, NFLX, TWTR, AMZN, GOOGL, TSLA and IBB. 2015 has been one of the most difficult year for many traders, myself included. Before we start trading in 2016, let's take a look at how the market had performed in 2015.